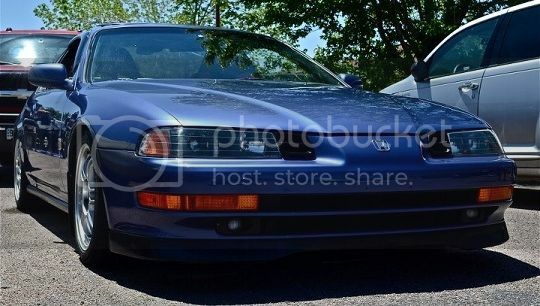 Hey guys, I'm relatively new on this site, and own a 4th gen silver honda prelude si with an f23 dohc non-vtec motor (go figure :P). I'm planning on buying some new rims, and after much thought, these are the two that i narrowed it down to.... Please let me know what you think about how they would sit on my car, or look for that matter! the F23 came outta the 6th gen accord. easily swappable into our cars. 17s will fit fine i have them on my car my tire size is 225/75/r17. the only problem is i lowered my car a inch and a half and if u hit a pot hole they hit the plastic in your fender well makes a awful sound like you fender is getting smashed. and they make the car ride rough due to the fact u pretty much have tireless tread around a rim lol. lmfao @ 75 series tires. time to fix a mess up on my part the tires are 225/45/r17. thanks for saying something the 75s r off my dodge ram lol. yah f23's are normally sohc, but this one's defs dohc. hmmmm frankenstien could make sense... you think maybe an h23 head? i think i will but do you think that 195's would be too skinny? well i decided to go with some volk/rays 16's which were the same price! They look sweet and i'll post some pics as soon as they're on :) thanks everyone for your help!